There are rumours that the French government is trying to bring about changes to the system which will make it more like the NHS. Doctors went on strike against the idea and are threatening more action later this year. Unfortunately our local hospital doesn’t have a good reputation and people try to go to Reims for operations and even for consultations with specialists. The new system would reduce or even dispense with patient choice. At the moment things still move pretty quickly here however. For esample, Whale complained that he was short of breath and when the doctor came on Tuesday she ordered a blood test and x-ray. The nurse did the blood test on Thursday morning and at 8.15p.m. our doctor called to say the results indicated a problem and she wanted him to go into hospital. Five minutes later she called back to say they were sending an ambulance and she would bring a letter and ‘bon de transport’ herself. The doctor and ambulance arrived together about ten minutes later and off he went; no time to panic! However, it transpired that he had to wait over two hours in A & E before being seen which accounts for the fact that they couldn’t tell me anything when I rang at 10.30. They even implied that he might be sent home that night. At 11.30 they said he had been taken to a room and they were waiting for test results. She agreed and I warned CC and Jay to listen for the phone and come and wake me as I sleep like a log. Next morning I rang at 8.30. No news. Ring again at 11. A few minutes before 11 Whale rang me, courtesy of the hospital phone. “They’re sending me to a ward. I don’t know where but there’s a problem with my left lung.” He sounded rather worried. I promised to ring them and find out what was happening and where they were taking him so we could bring in all the things he needed. They said he was going to the pulmonary ward but didn’t clarify what was wrong. CC, Jay and I went in at 3 o’clock but CC, being claustrophobic, was surprised to find that the door to the staircase was locked. In fact, there was a notice saying “This door must remain closed and locked at all times”. How crazy is that? She went for a coffee in the entrance hall and Jay and I and found his room on the third floor. It’s a double room but the other chap seems very pleasant. Whale’s main concern was that he should have the telepone connected so I went to ask for the necessary form. The system had changed since the last time and now telephone and television were dealt with in the same office with no need for a form – just the name and room number. It was best not to tell CC about that little adventure when I saw her at the coffee bar. She was still drinking so I went to find the telephone office myself. There was a queue but eventually I organised a connection for Whale putting 20 euros on his account so that he could phone England and went back to his room with the details. He was happy and having supplied him with books, biscuits and mineral water we said goodbye. He rang this morning to say they had diagnosed pleurisy and give a list of things to bring in at visiting time this afternoon. 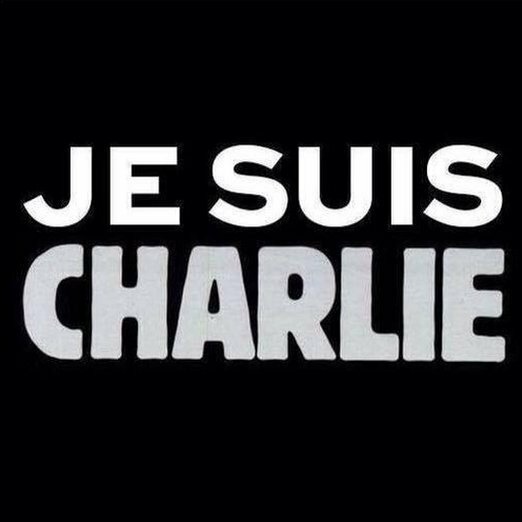 This is not my post but I think it merits sharing after the cowardly attack which killed 12 people in Paris. Their magazine may have offended some people but they didn’t deserve to die. 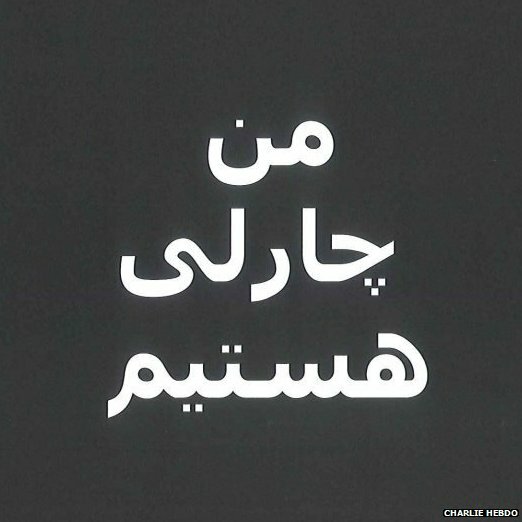 There has been an outpouring of posts on social media in the wake of the attacks in Paris, with 1.3m tweets alone using the hashtag #CharlieHebdo.This graphic (in English: “I am Charlie”) was shared more than 140,000 times in the first hours after the attacks. 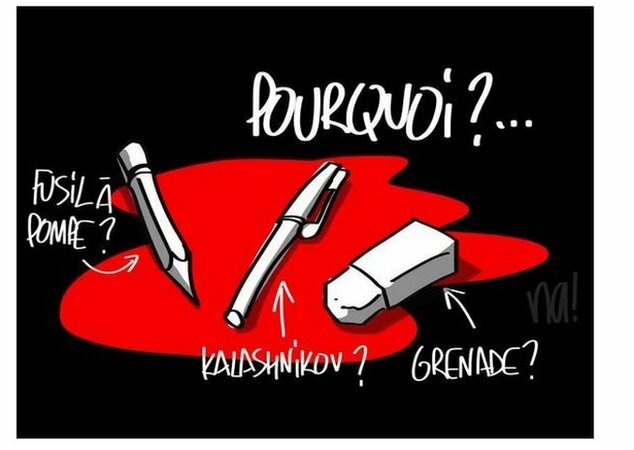 Le Monde and L’Express cartoonist @plantu tweeted this image. 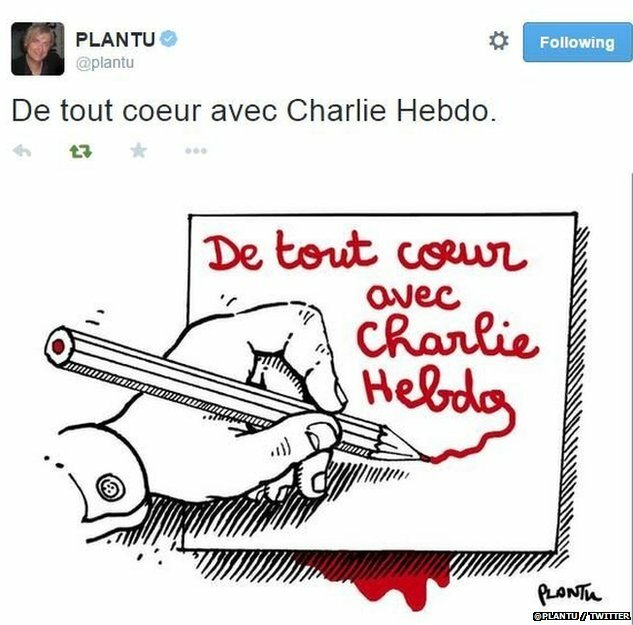 The text reads: “We are wholeheartedly with Charlie Hebdo”. 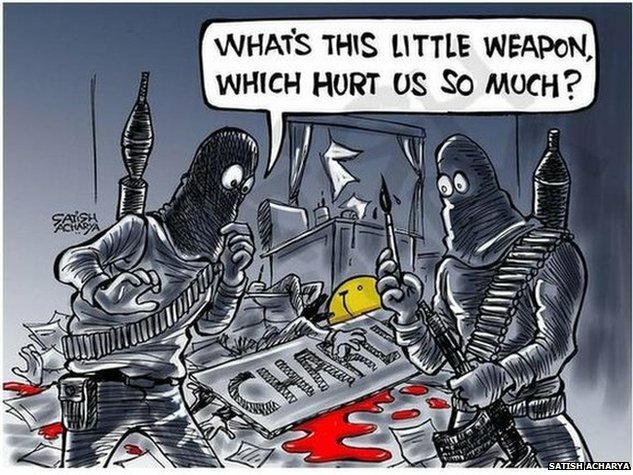 Charlie Hebdo’s editor-in-chief Gerard Biard, who was in London during the attack, said: “I don’t understand how people can attack a newspaper with heavy weapons. 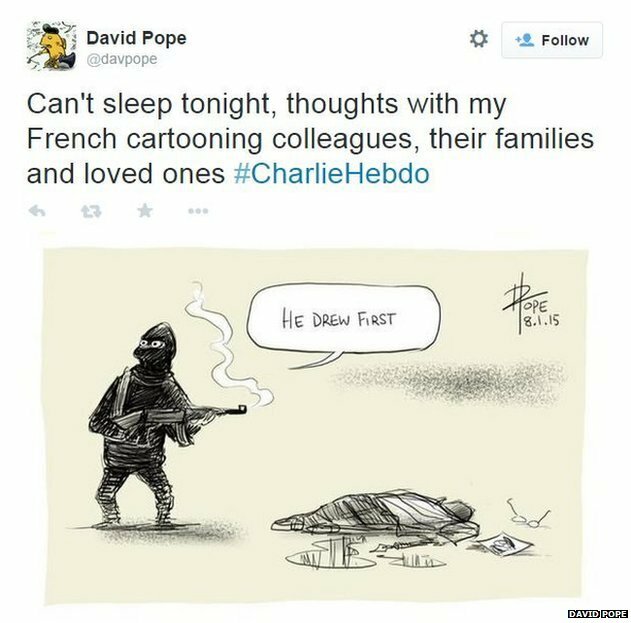 A newspaper is not a weapon of war.” Cartoonists picked up on the ‘mighty pen’ theme. 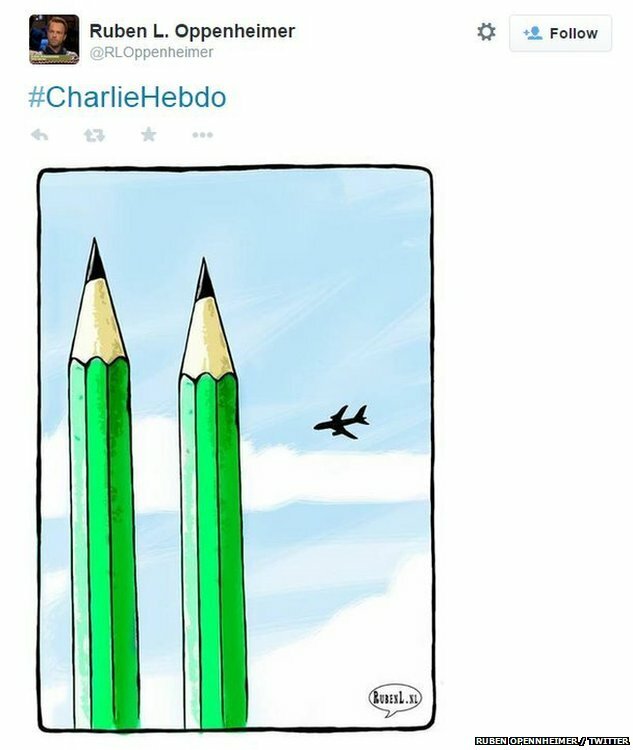 Previous Charlie Hebdo covers were also being shared on social media. The text of the most popular reads: “Love is stronger than hate” and shows the editor of the magazine kissing a figure that many have interpreted as the Prophet or one of his followers. That front cover was published after the magazine’s offices were attacked in Nov 2011. 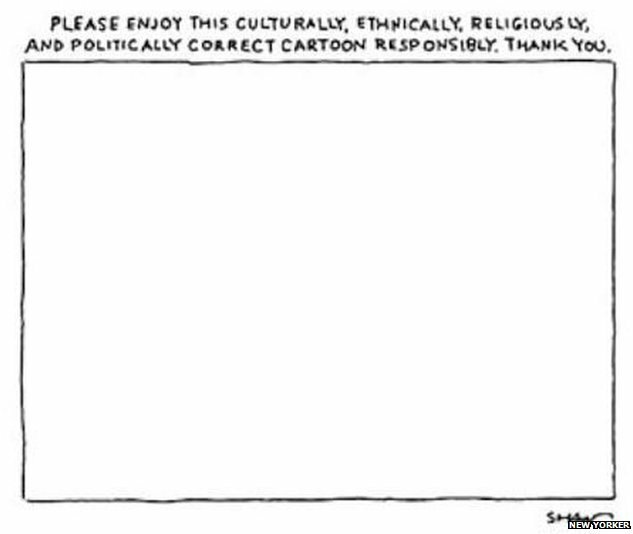 Dutch cartoonist Ruben Oppenheimer drew parallels between Wednesday’s shootings and the 9/11 attacks. 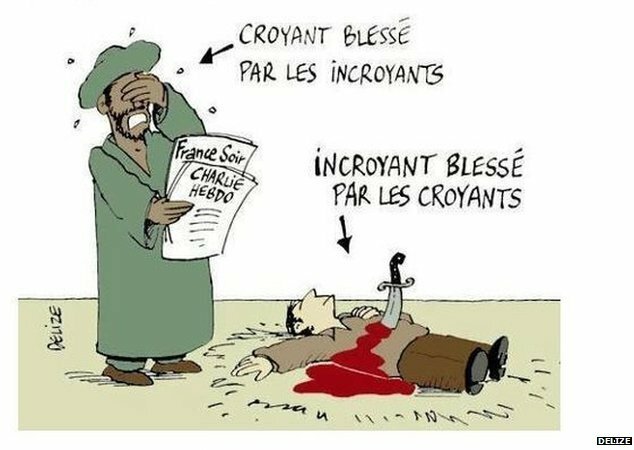 Some posters went straight to the heart of the issue by sharing a cartoon by the French artist Delize. The text reads: “Believers hurt by non-believers” (the man crying on the left) and “Non-believers hurt by believers.” (the man lying in the pool of blood on the right). This morning things went a bit awry. It started when Bear decided to get dressed at 25 past 8 and I knew the morning would be disrupted. Sure enough, after he had had his breakfast he decided to climb over Kica’s bed to take down the Christmas cards upsetting my sewing box in the process and spilling all the pins into her basket. I asked him to stay on guard to keep Kica and the cats out of the way until I could clear up the mess. I started on the glass and water and had just about done the worst when the doorbell went. It was the neighbour who had asked me to help him with some translations a few months ago. He came bearing champagne and chocolates and expecting to stay for a coffee. He saw the vacuum cleaner and picked up on the fact that I was a bit frazzled so i managed to curtail his visit by giving him a large slice of Christmas cake to take home and share wirth his wife and daughter. Then it was picking up pins with a magnet and, finally, things began to get back to normal. *Is it just me who finds it odd that Whale keeps a glass with water in it on his table when he has a bottle of Evian there as well? What I mean is, if i want a glass of water i pour it in the glass and drink it straight down and then get on with what I’m doing. Glasses have been knocked over many times on Whale’s table because it is always being moved backwards and forwards between his bed and his chair – and both CC and I are famous for being clumsy. When i asked him why he couldn’t put water in his glass when he was thirsty and drink it all up he was quite surprised and said he liked to sip it from time to time. I pointed out that it was more difficult to clear up broken glass together with water but it fell on deaf ears.